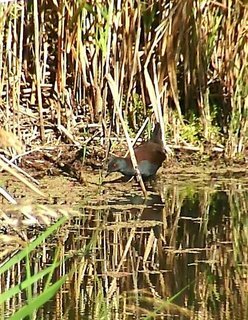 John & Shirley Tongue write: We were pleasantly surpised today (Thursday) to get a reasonable shot of only our second ever Spotless Crake. 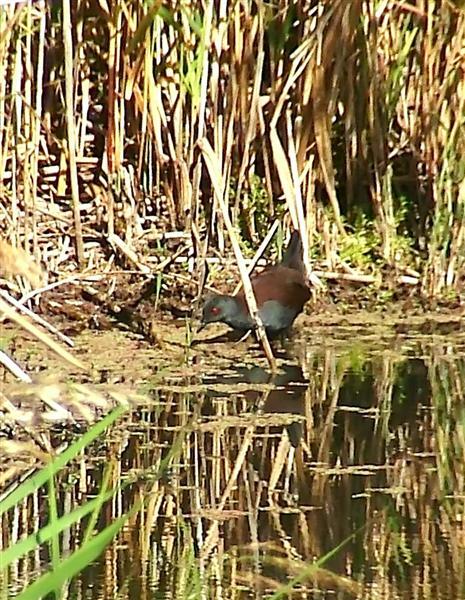 It was at Gould's Lagoon, (Granton) and put on a good show for us, even appearing in the background of a couple of our shots of a very striking Purple Swamphen. The signs at Gould's Lagoon speak of Spotted Crakes there, too, though we have never 'spotted' them there, or anywhere else! Just seen my first Crescent Honeyeater in the garden this year, marking for me, the beginning of Autumn. In fact most of those I see there are males, the image shows a female photographed a week ago in nearby woodland. If the Little Wattlebirds don't hassle them too much, no doubt I'll hear their 'egypt, egypt' call, incessantly for the next 5 or 6 months. 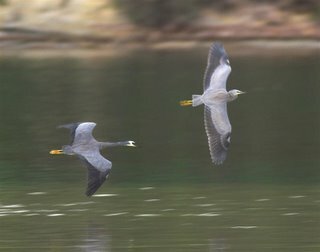 I went birding in the middle of the day on Tuesday, something I rarely do, but it was such a great day, I couldn't resist! 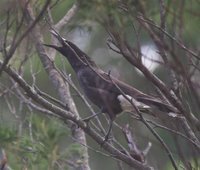 I was struck with the overall lack of bird activity (good reason not to go at that time), with the exception of two species which were very active--Forest Ravens and Grey Currawongs. 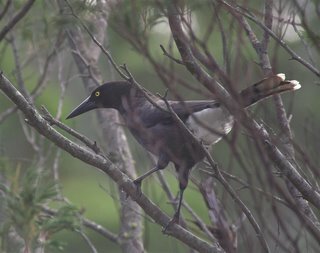 I often hear the clink clank of the Grey Currawong, but rarely catch more than a distant view. I came upon a small group, quite probably a family, which flew off as I approached, save for this individual pictured. It sat in the tree and called repeatedly, with no result, and seemed to get quite agitated, before it too flew off, in the opposite direction to the rest of the flock. I must confess that I used to have some difficulty in differentiating the Grey, or Clinking (my preference) from the Black, mainly because one tends to see only their backs, often at some distance, as they fly off. This Currawong has kindly raised its' tail to show the diagnostic white undertail coverts. In recent Winters, they occasionally frequent the gardens in my neighbourhood, much to the consternation of the local birdlife. 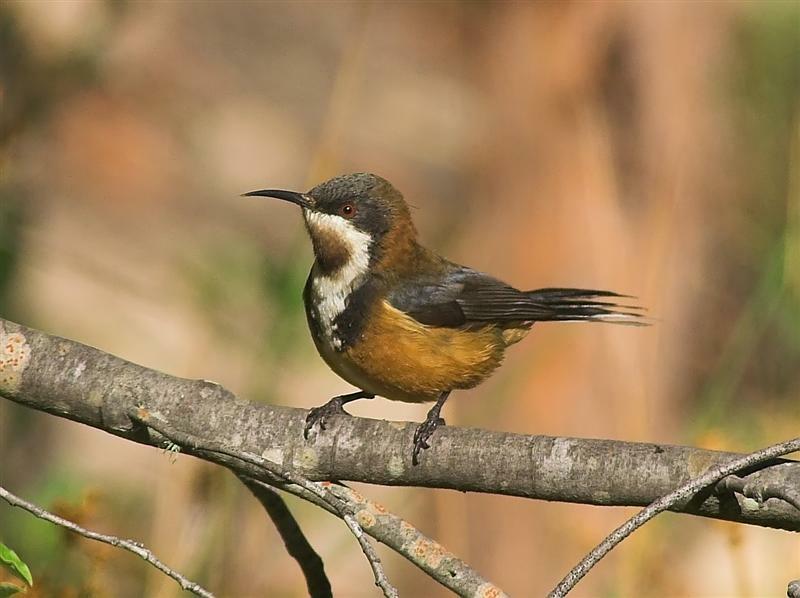 If any Tasmanian bird deserves that epithet, I'm sure it would be the Eastern Spinebill. 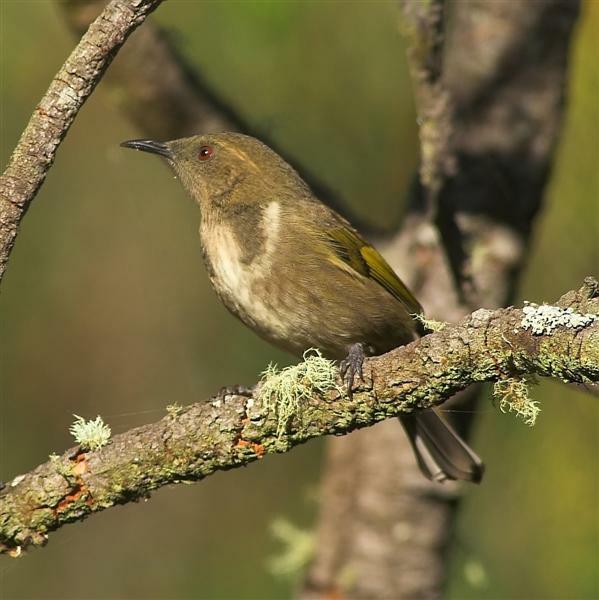 Our smallest honeyeater, but still something like twice the length and around four times the weight of the average hummingbird, but they have certain behavioural traits in common. They seem to dash in, feed on some, often tubular flower, frequently while hovering, and they're off again--perhaps it's the high glucose diet! The Spinebill, in my experience, is something of a nomad for much of the year, and I can't think of a spot that I could go to with any certainty of seeing one. Locally they seem more numerous during the flowering of the epacris, common in open woodland and heath, and flowering during the colder months. At other times, grevilleas and small flowered fuchsia seem popular. I've yet to see more than three or four at a time, usually on some particularly favoured flowering shrub. Pictured here is a male, photographed earlier this month, possibly an immature bird as it doesn't appear to have acquired the bright red eye of an adult. 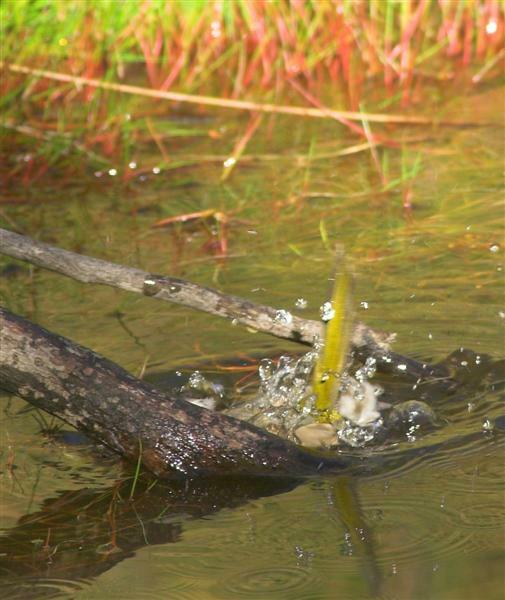 A 1st year Green Rosella enjoys a dip. 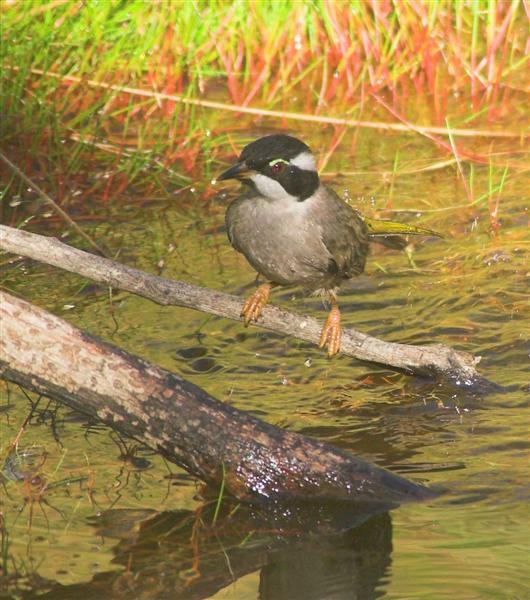 These birds spend a deal of time in the water washing their plumage. I've posted this image to show the 'green' stage of this rosellas plumage. In fact, I believe at this time of year, they're still undergoing moult, which may explain the frequent batheing. I've often noticed them in streams in other parts of the state, sometimes with Bluewing Parrots. Another explanation could be that they are subject to the ravages of feather lice or similar parasites! 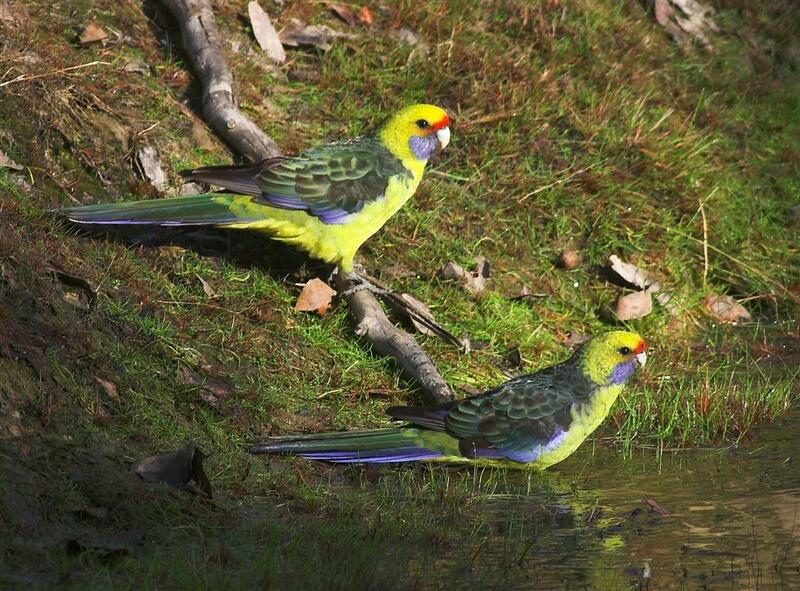 I thought the accompanying image of a pair of Green Rosellas may be of interest. 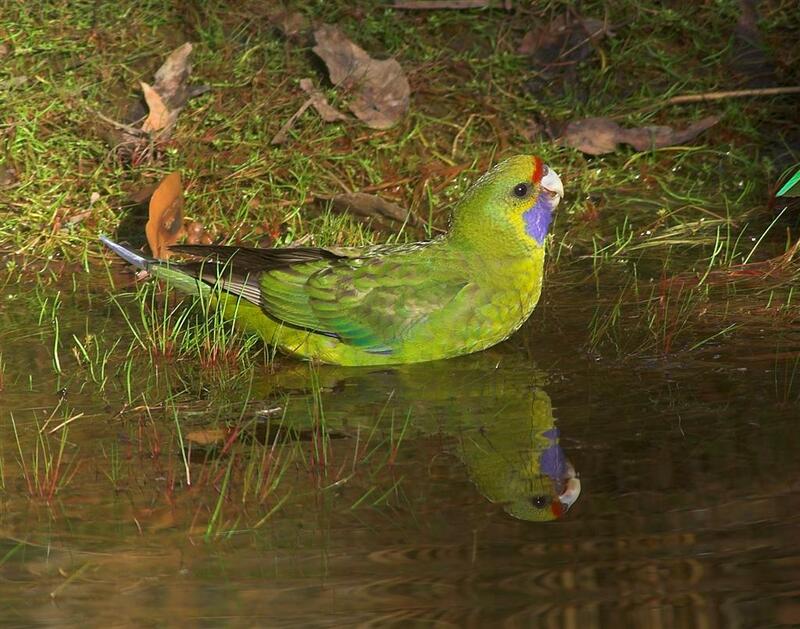 I have photographed numerous Green Rosellas over Summer, either bathing or gorging on the fruit of the Native Cherry. Most of the flocks I've seen have been made up solely of the green plumaged, immature birds, which suggests that this breeding season was good, at least locally. This image, by chance, shows both male (upper) and female adult birds in juxtaposition, and enables comparisons of plumage etc.. I was quite struck by the differences, both in 'bulk' and in bill size. 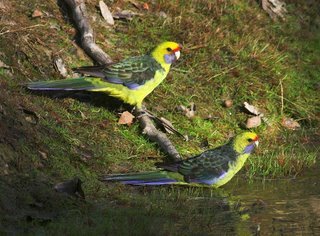 I guess we don't often get the chance to see them like this, and usually just make a mental note, 'Green Rosellas', as they noisily disappear from view! John & Shirley Tongue write: There is great excitement in our household today! (Thursday). Never having had much to do with the sea, neither of us had ever seen any of the truly pelagic birds. We've been looking to get on one of the pelagic trips, but they're mostly on Sundays, and being a church minister, that doesn't really work for me!! 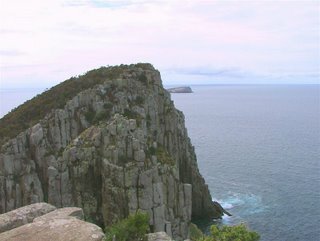 Anyway, today we walked from Fortescue Bay to Cape Huay, on the Tasman Peninsula. The whole area had recently been burnt--last year I think, so bush birds were pretty unrewarding, except for three Flame Robins. 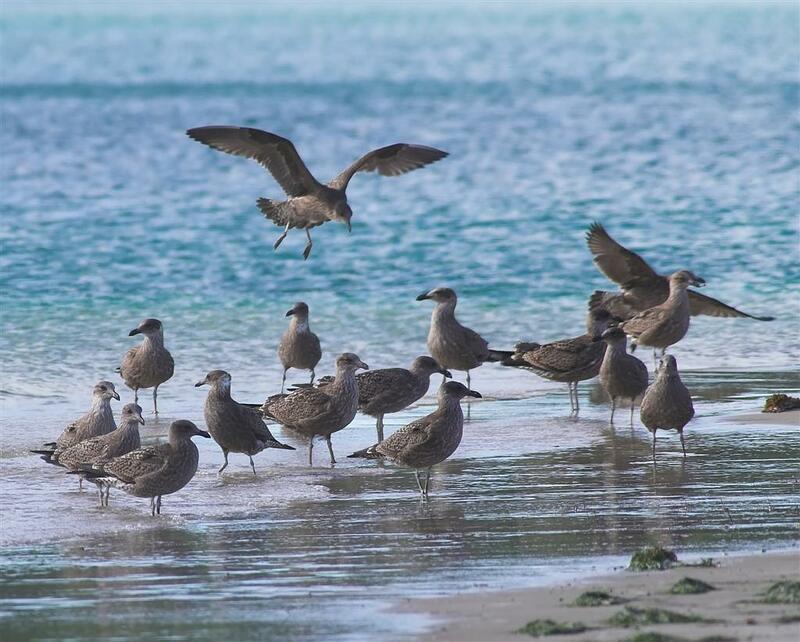 However, when we got to the Cape, there was a "pod" (flock? mob?) of seals feeding off Mitre Rock, accompanied by assorted Gannets, Cormorants, Gulls and Terns. Also, to our excitement, we were able to identify a number (perhaps 15-20) Shy Albatross among them. These are supposed to be very common, especially around the Hippolytes, but they were the first Albatross-of any variety-either of us had ever seen. Certainly not a GOOD look, at them, but identifiable, and very exciting for both of us, just the same. The photo shows Mitre Rock and the Candlestick in the foreground, and the Hippolyte Rock beyond. At this stage, the seals and the birds had gone behind Mitre rock. At his request, I took Denis Abbott to see the "much vaunted" waterhole in the Meehan Range today. 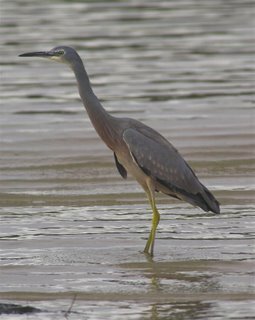 With the cooler weather, there are fewer birds visiting, but despite that, some 12 species, perhaps more, partook of the waters. Denis wanted to try out his new digital camera and thought this might be a good spot. I suspect he found there was a fairly steep learning curve! But there are few short cuts and practice and patience have their own reward. 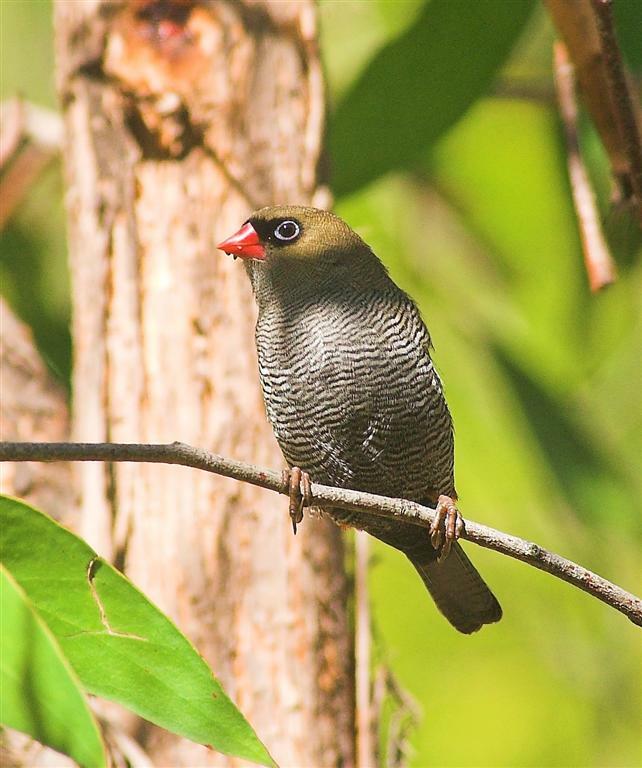 I feel my reward was getting the chance to take the accompanying pix of the aptly named Beautiful Firetail. 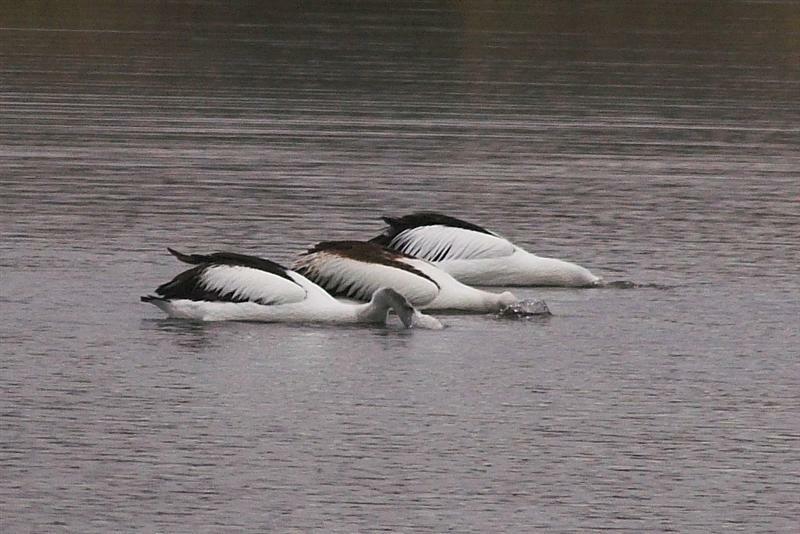 I had seen them coming down to the water on previous visits, but they are generally fairly secretive in their approach. This year I've only seen odd birds and not the usual family groups. 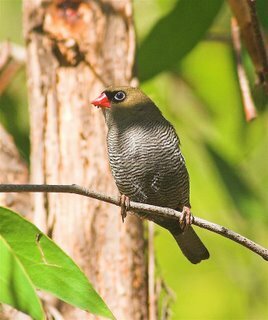 The Meehan Range appears normally to hold good numbers of Firetails. 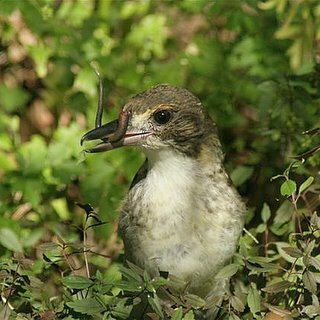 A measure of a successful breeding season is probably most easily seen in the number of young birds produced. The accompanying images are of some of this years young Pacific Gulls, Kelp Gulls and Crested Terns seen recently on Marion Bay Spit. The gulls are most likely the progeny of birds nesting on Visscher Island, some few kilometres off shore. I'm not sure where the Crested Terns nest, but they too would have bred on offshore islands. 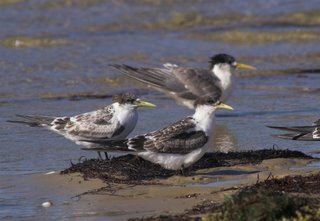 Many of the young terns are largely still with their parents and although they are quite capable of fishing for themselves, they also s eem quite able to "cadge" fish off passing adults. In contrast, the gulls are now left to their own devices and gather in species specific groups. 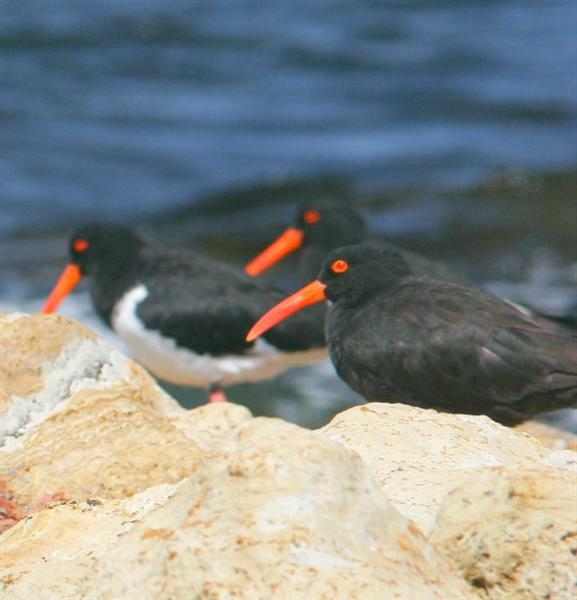 Felix Wilson sent in these 2 pix of aberrant Sooty Oystercatchers. He photographed them a couple of weeks ago at South Arm. If you click on and enlarge them you will see one has a curved bill and the other has a number of white feathers among the otherwise black plumage. He poses the questions, are the white feathers a result of interbreeding of Pied with a Sooty or just a genetic mutation? And what would cause the downcurving as pictured? He adds that Priscilla Park has a photo. 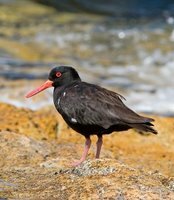 of an oddly plumaged Pied Oystercatcher. Has anyone else seen any to add to the list? It's not only Wedgetails that can act aggressively to one another. 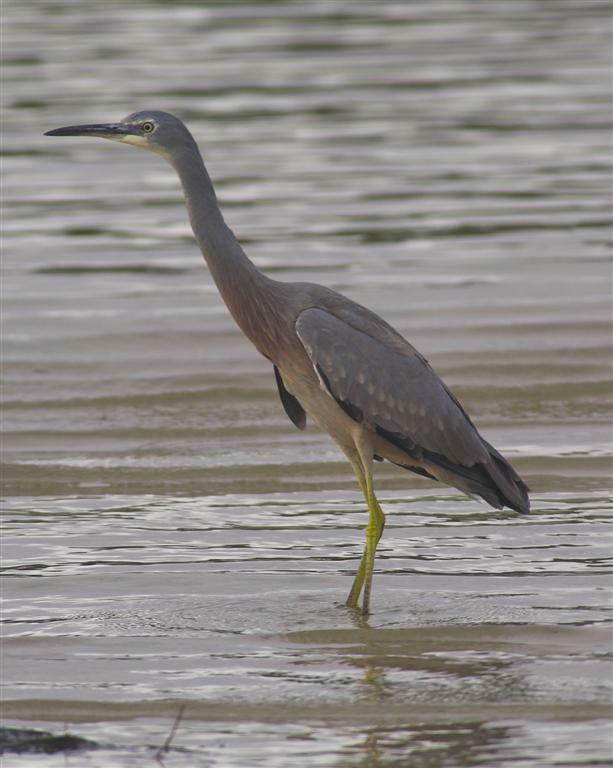 While down at Marion Bay recently, I became aware of the sound of a heron calling "aggressively"--if that makes sense! Shortly after, I found the source, a couple of White-faced Herons playing chase. The chaser seemed pretty agitated, but I've no idea what caused it. 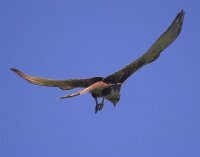 They were surprisingly agile for 2 slow flying birds, not usually known for their aerial skills. I lost interest as they disappeared into the distance and I swapped my interest to a flock of Bartails. A few minutes later, the heron pictured here, landed very close by and stayed long enough for me to take several shots. I was surprised by its' landing so close, but wondered later, whether it was the bird being chased and I was some sort of safe haven. John & Shirley Tongue write :Does anyone know whether Wedge tailed Eagles "kick the 'teenagers' out of home"? For the Labour Day Holiday, we visited Bruny Island, and between leaving the ferry, and coming to the Barnes Bay turnoff, we noticed three Wedgetails. We assumed these to be a family group, but were surprised when we stopped for a closer look, to see quite an aggressive display going on. They were all swooping and diving at one another, and calling excitedly as they did so. Unfortunately, it was all too suddenly over, as the three swooped low over the trees heading away from us, and were gone. 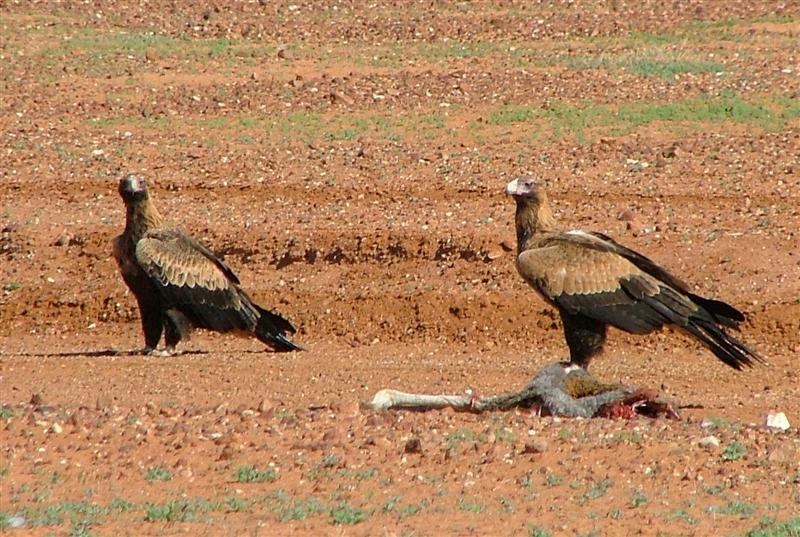 Not even time to grab my camera (I cheated with the pic--it's of eagles in Central Australia a couple of years ago). Could this display have been Mum and Dad giving "Junior" his marching orders? Noted 5 Little Egrets at Marion Bay this morning. Couldn't get within "shooting" distance, so no pix. Two were sporting the long head plumes of breeding plumage, so I suspect they are most likely new arrivals, although I'm aware that some spend Summer here. 40+ Sulphur-crested Cockatoo near Marion Bay turn off. On or near Marion Bay Spit-- 12 Hooded Plover (5ad. and 7 Juv. ), 36 Bar-tailed Godwit, 14 Pelican, c150 Red-necked Stint, c5 Double-banded Plover. 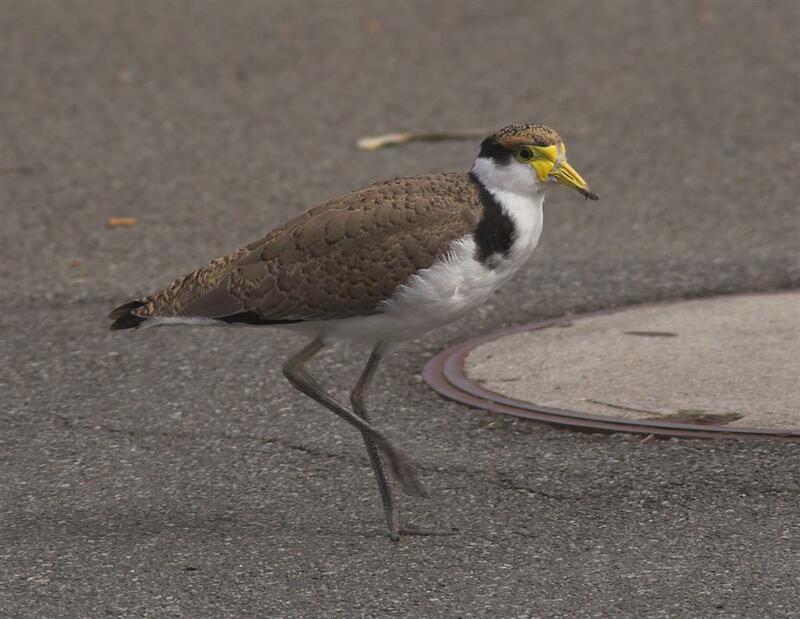 Well despite my dire predictions about the Masked Lapwing chick (see Late Starter at Kindergarten Jan 14th), it has made it to the flying stage. Photographed here (in the middle of the road!) only 20 metres from the previous photographs. John & Shirley Tongue write : The activity of White-throated Needletails, a species we haven't observed often, is generally associated with the approach of storm fronts. It's assumed they're attracted by the insects stirred up by rising air currents connected with the approaching front. An experience we had on Monday, indicates that this isn't always the case. While we were on a brief visit to North Bruny Island to try to photograph Forty-spotted Pardalotes, we happened upon the largest flock of Needletails we have ever seen. Just before we reached the lookout at Bull Bay, we noticed something flash by low down, which at first we assumed was some sort of falcon, with the fleeting glimpse we got. 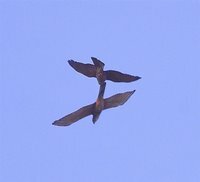 We pulled over to investigate, and realised we had seen one of a flock of about 50-70 Needletails! They were very low down, swooping over the tree tops, and out over the bay. In fact, some of the time, we were looking down on the birds. There was a gusty westerly blowing, and so perhaps in the lee of the island there were turbulent air currents stirring up insects. Certainly, when we stopped nearby to search for the pardalotes, (which we saw, but couldn't get a decent photograph) there were huge swarms of insects hovering around just above the tree tops. Perhaps, again, we just happened to be in the right spot at the right time to witness this amazing spectacle. Needless to say, they are extremely difficult to photograph. 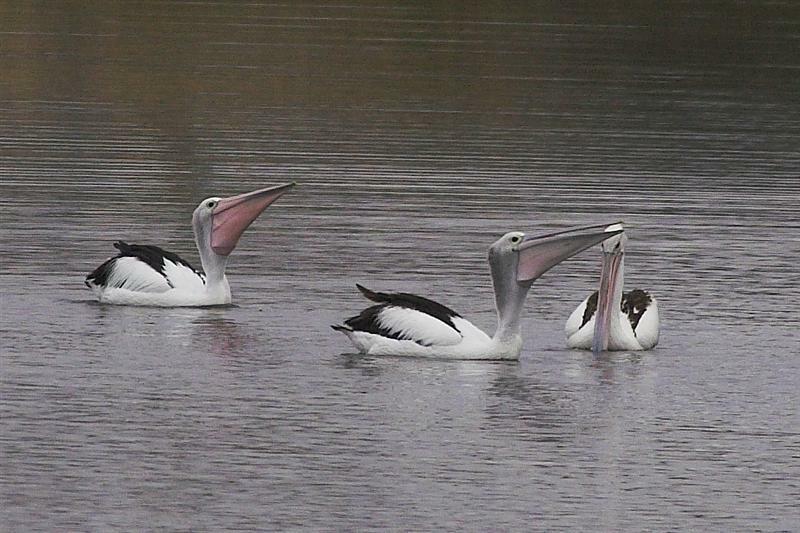 Many of us would have noticed the small flock of Pelicans in Orielton Lagoon, usually roosting on Suzie Islet. Numbering around 5, I've often wondered where they feed as I haven't seen them feeding in the lagoon. By chance, after an early start, I noticed them fishing in Orielton Creek, on the northern side of the Shark Pt.-Sorell Rd.. As you can see, they were working as a team, driving (presumably) small fish moving up the creek on the high tide, and they appeared to be successful. 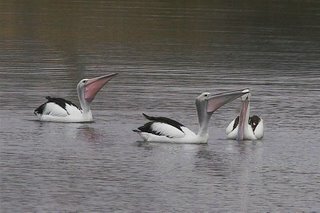 Several years ago, on the Tamar River, I watched a flock of Pelicans over several days, and was s urprised to note that once they'd had a good feed, they didn't feed at all the following day. I assume this strategy would hold them in good stead over lean times and when on the move. 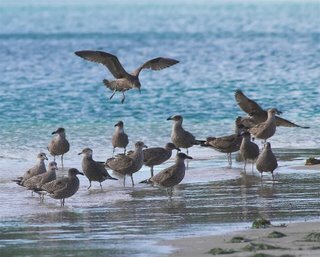 The largest flock in the South, can usually be seen at Blackman Bay (Dunalley), sometimes numbering 50 plus individuals. "You're Sure of a Big Surprise!" 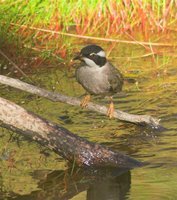 Another day in the Meehan Range, lots of birds enjoying the waterhole, until alarm calls, first from the Woodswallows, followed closely by calls from the Strongbills. Possibly, as many as 50 birds going berserk. Why? Couldn't obviously see anything, although I had seen a Butcherbird earlier, high in a dead tree overlooking the area. But I'd seen that fly off. That was obviously part of its' strategy, for I suddenly became aware of an immature Grey Butcherbird, observing me from a few metres away. 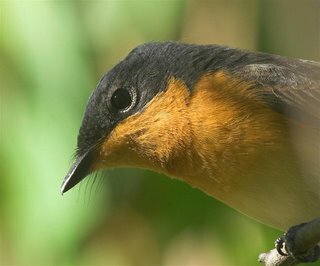 The only birds remaining were either the brave or the foolhardy--the Grey Fantails and the Yellow-throated Honeyeaters. I think the former were trusting in their flying ability and the latter in their size--a risky choice. 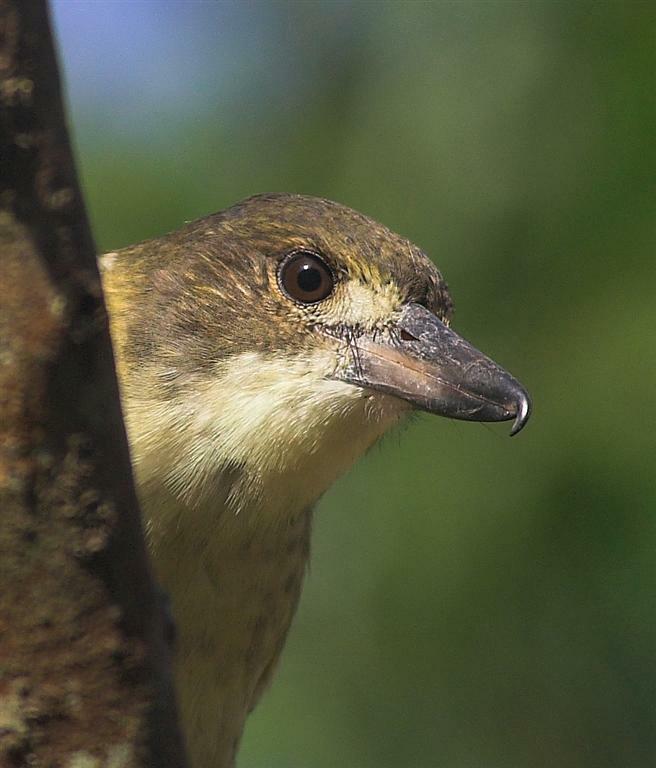 From my observations over the years, the Butcherbirds are accomplished killers of sparrow sized birds, relying on ambush. Just look at that bill! I know from handling them while banding, that once they 'lock on' to your hand, they often require assistance to remove them. Fully expecting to see a 'kill', the tension was, in part, relieved, by the appearance of a pair of Forest Ravens. The Butcherbird left, having been 'trumped' by the ravens, but the idyll of this oasis was destroyed for the rest of the morning. One That (hopefully) Got Away. 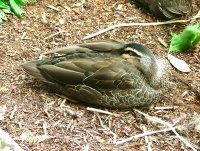 John Tongue writes : This Pacific Black Duck, one of the few pure bred duck at the Hobart Botanical Gardens, wasn't really phased about being photographed. I've heard that Mallards hybridise with a number of species around the World, and they certainly do here in Tasmania. In many places, while there are many 'ducks' present, it can be a bit tricky picking a pure Black Duck or Mallard. And you sure get some wierd and wonderful combinations, with crosses of crosses and so on. I guess it's a bit like most feral problems, there is little that can be done to effectively stem the tide. At least the Mallards are mainly confined to the urban areas. Spent the morning in the Meehan Range and one of the birds I didn't see, or hear, was the Satin Flycatcher. Over the past few months they have been one of the more obvious birds, with there strident, rasping call, and I have managed to photograph them on a number of occasions. It would seem likely that they're on their way North. Time will tell. A while ago, I blogged a piece on "Dust Baths" and since then I've googled the subject. 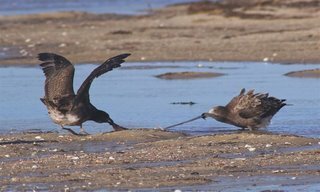 There seems no end to possible theories why birds do this, but they seem to come under the general headings of, 'Anting', 'Dust Baths' and 'Sunbathing', and often in combination. A week or so ago, I watched this Satin Flycatcher, sunbathing on a branch for nearly 10 minutes. She faced one way, then the other with wing extended. While this was going on, the male satin was also sunbathing. But unlike the female, he spread both wings, while lying flat on the ground, some distance away. I can't from memory, remember seeing Satins sunbathing before, and rarely see them on the ground. Why do they do it? Well I suggest you 'google' it too, and add your theory to the growing list! 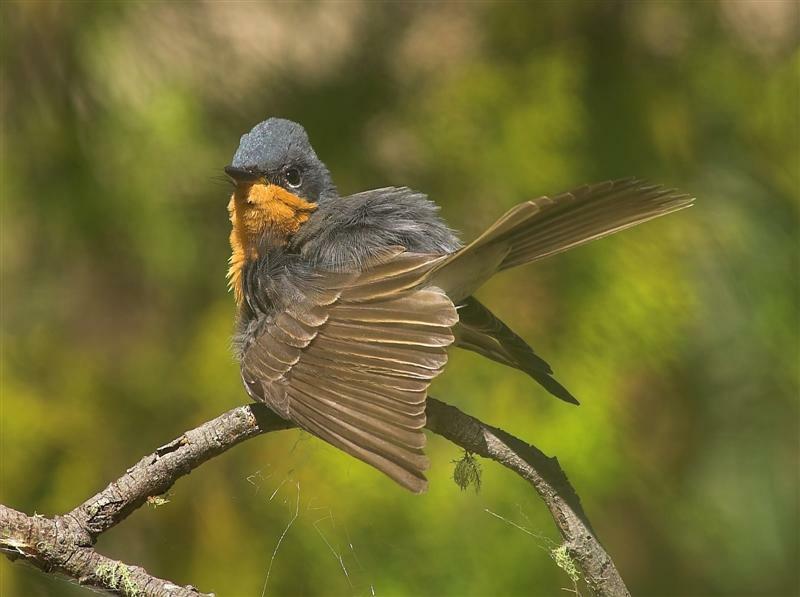 Have you ever tried photographing Grey Fantails? 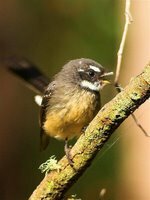 I was standing among the scrub surrounded by fantails, well that might be a slight exaggeration, but there were at least 10, probably more. They had discovered me. They flitted around me, occasionally scolding, never still, and try as I might I just couldn't get a shot of any of them. No sooner did I see one in a suitable position, than it pirouetted and quickly moved on. It's not for nothing they've earned the nickname 'Cranky Fans'! I did finally get a shot of sorts, seen here, of one scolding. While this was going on, and probably attracted by the commotion, they were joined by a female Satin Flycatcher. It sat about 2 metres from me, and just looked, cocking it's head from side to side, more reminiscent of a dog! At that range the very wide bill and bristles were evident. To take a shot of it at all, I had to slowly back away (it was too close to focus on) and managed a few shots of just the head--as shown. In a few minutes it was all over--but those few minutes are one of those events that will be remembered for a long time. Over the years I've been involved in vetting records of bird sightings and I must confess that I'm basically a sceptic--unless of course they're my sightings! 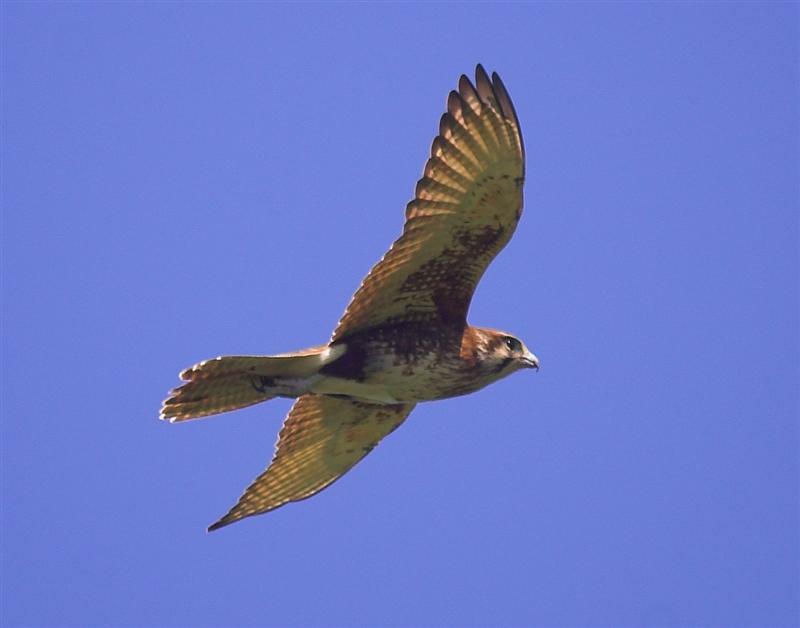 The sightings of Nankeen Kestrels, especially in the South of the state, are always problematic. 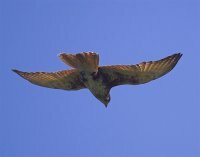 Many, newer observers, seeing a hovering bird of prey, immediately label it 'Kestrel'. As you see from the accompanying images (shot at Copping), given the right conditions--a strong updraft on the downside of a hill--the Brown Falcon, is an accomplished hoverer. The series show a 'brown' going into the hover, hovering, collapsing the lift prior to diving, and diving. 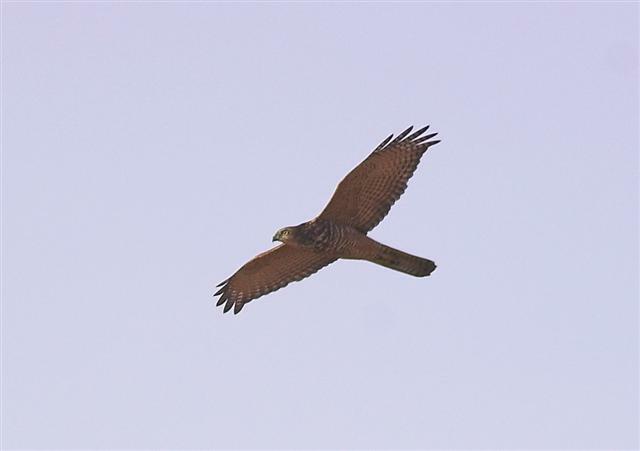 In the South, you're more likely to see a Kestrel in the Winter, but do give that hovering bird, a second look. 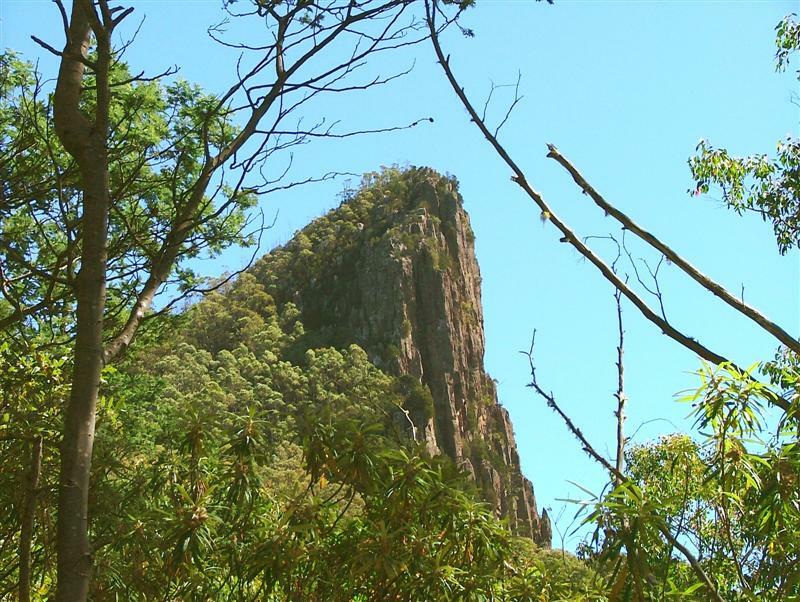 John & Shirley Tongue write: On Thursday, we climbed Cathedral Rock, overlooking Northwest Bay, in behind Mt. Wellington. On the way, we passed through some pretty dark, damp areas of forest, where we came upon 4 to 6 birds we were fairly confident were Scrubtits. The habitat and behaviour were right, though we assumed they might be juveniles, because they were very plain chocolate-brown. 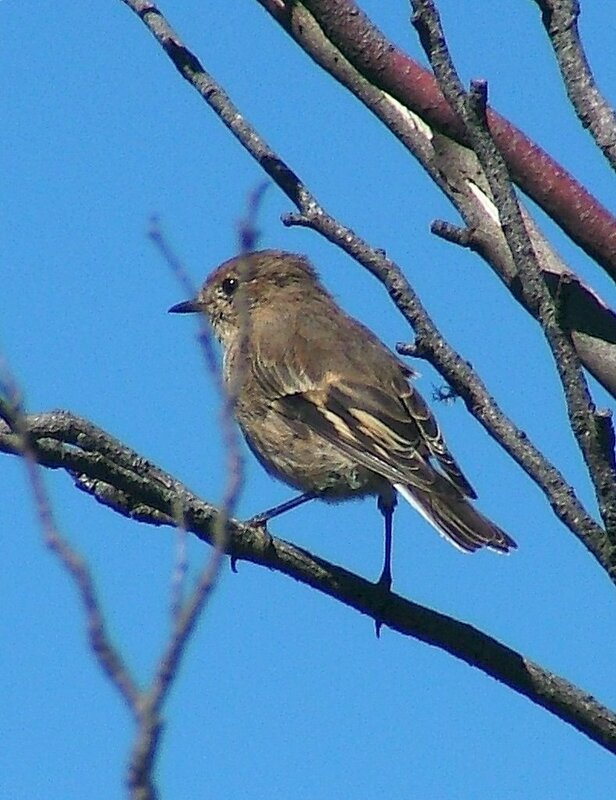 At various times we also saw Scrubwrens--confident of their ID, and much more olive-brown. However, at one stage, in much drier, more open scrub we saw about 3 more of the dark chocolate-brown birds. 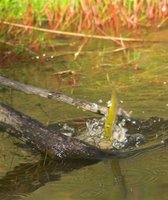 Again, we thought, "Scrubtits", but the habitat didn't seem right, and they were feeding mainly on the ground. Does anyone know an easy way to separate juvenile Scrubwrens from juvenile Scrubtits? Or could Scrubtits have been in much drier and more open forest, feeding on the ground? Or were we mistaken with the earlier birds? We did have a good day for endemics though. 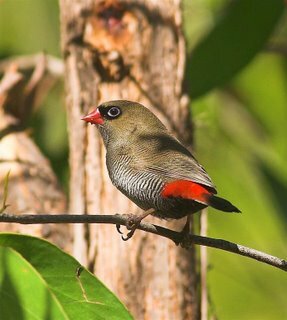 Assuming we did in fact see both Scrubwrens and Scubtits, then we only missed out on Native Hens and Forty-spotted Pardalotes out of the 12 endemics. The accompanying photo is of a cheeky Scarlet Robin who came to investigate us closely as we ate lunch right on top of Cathedral Rock. Bill & Els sent in the following info. on the pelagic birding trip from EagleHawk Neck, last weekend. c50 White-chinned Petrel, c5 Buller's Shearwater, 2 Sooty Shearwater, 1 Little Shearwater, c12 Wandering Albatross, 6 Black-browed Albatross, c200 Shy Albatross, c40 Yellow-nosed Albatross, c20 Buller's Albatross, 6 Grey-backed Storm Petrel, 8 White-faced Storm Petrel. Sounds as if it was a good trip, they also added they saw a Marlin. I believe the deep sea fishing is pretty good at the moment. Bill & Els sent in this picture of a young Butcherbird with the 'detachable' tail of a skink. (And not as I wrongly guessed, half a worm! Thanks to John Tongue for pointing that out). They photographed it in their garden recently. They added that it went down still wriggling. I think that probably qualifies as 'too much information'. I decided to visit West Bay, South Arm, this morning and do a bit of wader watching/photography. 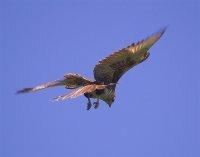 As I drove along South Arm Neck, hoping to see a harrier or two, I noticed what looked like a bird of prey atop the grassed sand dune. I turned the car round and sped back to find it was in fact a Brown Hawk--I nearly said only a BH. 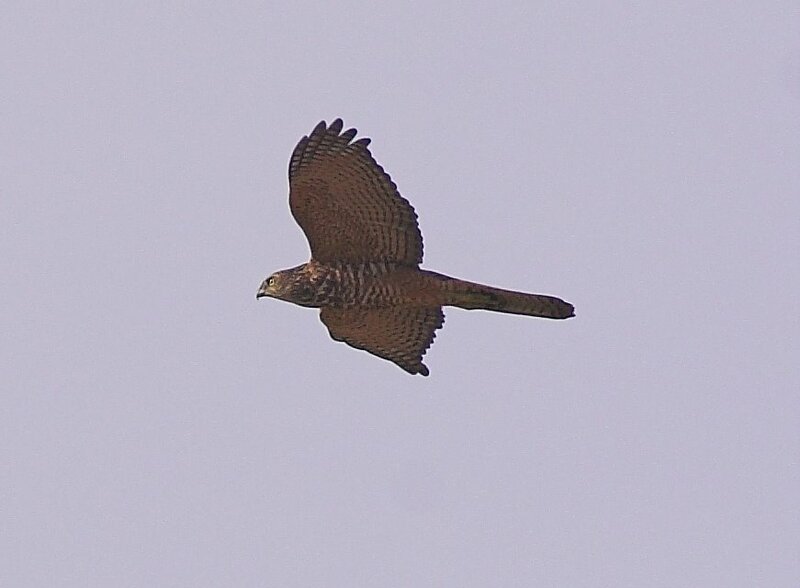 As I looked for somewhere to turn again, I noticed another bird of prey over the dunes, this one with a flap and glide flight, that I knew would have to be a Goshawk or Sparrowhawk. Hastily pulling over and grabbing camera, I watched as it neared (this is a comparative term!) and realised there were two. Almost immediately a food pass took place. Missed that as far as photos go. But I managed to take a few, rather poor shots, out of the car window, as they circled higher and further away, as a record of that chance encounter. Disappointed on the one hand that it hadn't happened rather closer to me, but on the other, I felt rather privileged to have watched these two birds, Brown Goshawks,an adult female, the larger, and a juvenile male, I believe, going about the business.